I Love You More Than Carrots: One Of Those Moments. I watched as he assembled the same fishing pole of my childhood, the one that spent many summer days cast out into the pond that sat lazily behind our house. There weren't many "big fish" in the pond back then but there was a plethora of "sunnies" that would nibble a line baited with anything from Wonder Bread to hot dogs. 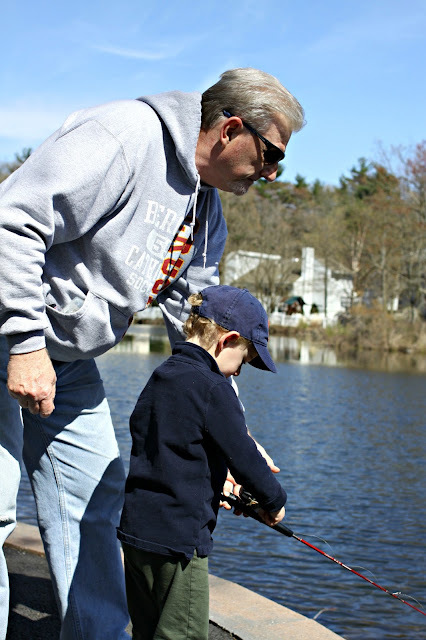 He taught me how to bait a hook, weight the line and cast it as far out into the water as my little arms could send it. More than technique, he taught me patience. He taught me to sit quietly and wait, keeping my eye on the red and white bobber that would no sooner signal the interest of a fish if I heeded his advice. I remember sitting patiently on the asphalt, the backs of my legs stinging from the heat of the summer sun as I dug through his bright orange tackle box. Picking through the bright lures that were so neatly organized in those little square cubbies, I never could decide which I loved more- the large gummy-like worms or the fuzzy lures with feathers and long tails that seemed to glisten in the midday sunlight. He taught me how to slowly reel in the one that almost got away. One slow turn after the next until I was sure he was hooked. Faster then, but ever so careful as to not let him get away. And then the most important lesson: the lesson of catch and release. I learned the proper way to slide my hand over the razor sharp top fin of the bluegill so that it fell softly backwards against the weight of my hand. I learned the hard way what happens when you do not handle a "sunny" this way. Imagine a paper cut that travels the entire length of your four fingers, from pointer to pinky, on the inside of where your knuckles bend. 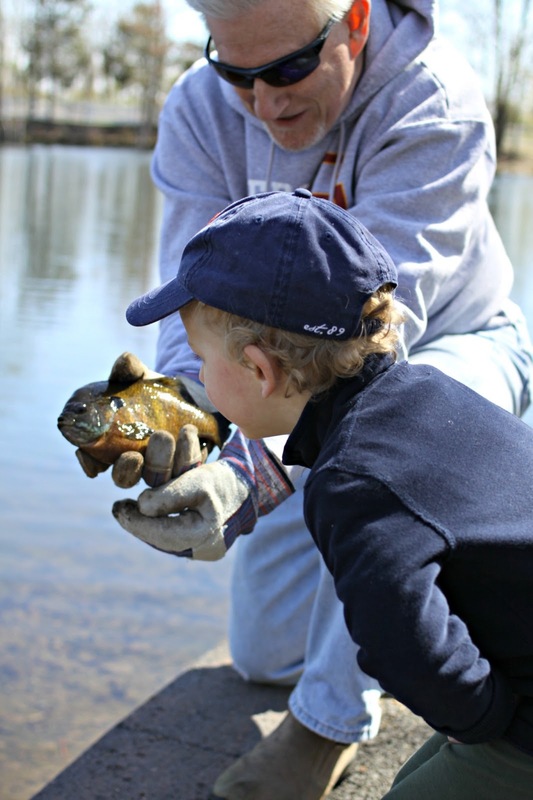 He taught me how to gently work the hook from inside the bluegill's mouth. He taught me how to celebrate the catch but to quickly release it back into the water where it belonged. In between all of these lessons, he would tell me stories of his childhood. How he spent his summers. When his father taught him how to fish. And when that old pole was assembled, I watched as he weighted the line, tied to it a brand new orange and yellow bobber and threaded it with a brand new silver hook. I watched as he carefully secured the end of the line with a slice of cork and handed that old pole over to my son. I watched them as they walked hand in hand down the path that led to the pond behind our house. I listened to them as they talked about casting lines and "catching a shoe-ish." I laughed as I heard him explain to the toddler that he has to be "really, really patient." As he cast the line out into the water, he handed the pole over the toddler who was already wiggling with excitement at his side, half-whispering half-exclaiming, "me me chance?! me me chance?" And we waited. And waited. And reeled in empty line after empty line. But then the bobber bobbed and the toddler let out an excited shriek. 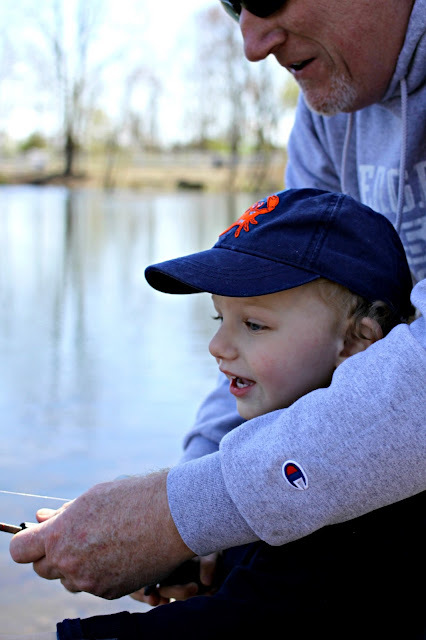 My breath caught itself in my throat and I watched as my dad helped my son reel in his very first fish in the very same spot of the very same pond that I had caught my very first sunny in some twenty-odd years ago. Slowly at first and then faster and faster. And just like he had convinced me to do some twenty-odd years before, he told the toddler that he had to kiss his very first sunny fish and unlike his mother, he was much too smart for that nonsense. So he touched it with his pointer finger. 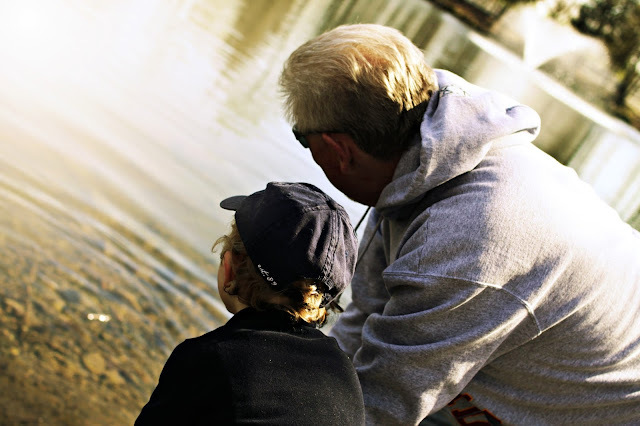 After explaining to him why it was time to release the fish back, he happily stood by and watched as my dad, his Poppy, gracefully removed the hook from its mouth and lowered the sunny back into the water. In the very same spot, of the very same pond with the very same pole that I caught my very first sunny with some twenty-odd years ago under the very same guidance of one of the best fisherman I know.